hat Do You Mean the 3rd Dimension Is Going Away? As 2012 approaches there is an increasing urgency to this message because we’re all, literally, running out of time to play in the third dimension. But before we can move into our vibrational home that is 5D consciousness, we must first become masterful of the vibrations and possibilities of 4D consciousness. This is the focus of the Shift for most people as we head into the ever-accelerating events of 2012. In 2010, we all stepped into the third level. As we move 2012, we will step into the fourth, and final, level. In that level, when you think, ‘I would like an apple,’ the apple is going to appear in your hand. Usually when I say that people get very excited. And it is exciting. However … there is a however. Copyright: You may share this article with your friends as long it is kept whole and our website is included. When we talk about transformation, the image that comes to mind for most of us is the butterfly. A beautiful, filmy creature that glides about the sky, bringing joy to our hearts. But we tend to forget what the butterfly has gone through, how it has struggled to reach its place on the breeze. Our path of transformation can be likened to that of the butterfly”s. Generally, when we embrace transformation, we only want to think of the end result. We don”t want to think about the work that goes into it, or the sacrifices we”ll have to make to be able to soar. I know that when I went through a transformation some years ago, I thought “Wonderful. Things will be better.” They were, but in the process there were attitudes and behaviors I had to surrender that were central to my life. Transformation begins with the Universe pressing us forward into desiring something better for ourselves. We may not know what it is that we want, just that we have this impulsion for something more. Originally, the butterfly was once a caterpillar, inching across the grass to climb up the marigold to reach its daily meal. Its main drive was to eat, to fill its stomach. The same could be said of us. Before we begin to transform, we have a compulsion to meander around; reading books, listening to tapes, attending lectures, digesting information. We”re still in the old form, fattening our minds up to get ready to build a cocoon, where we”ll use all that we”ve digested to transform our lives into a greater reflection of the Universal good. Once our appetite has been appeased, we”ll feel compelled to allow what we”ve learned to gestate. Letting it process is like the caterpillar inside its cocoon. This is the time to incubate. It may last for a few days or a few months. While it is happening, we”re changing. We may not see the change, but there are parts of us that are being released, transformed and altered. At this point, our lives will sometimes become very uncomfortable for us. During my transformation, I had an intimate relationship that got progressively difficult. When its transformation is complete, the butterfly begins its emergence from its cocoon. It must fight its way out of the old form, through the silky shell it created, letting it go, into a new world. Just as we must struggle to move through our barriers and outmoded attitudes. Behaviors that served us when we were caterpillars are no longer helpful. We can”t live the way we used to. We”re transcending the old patterns. But since they were familiar, and successful in our old form, we resist discarding them. I eventually had to release beliefs that were no longer in my best interest. No longer could I play a role that I had outgrown. The relationship came to an end. It was very painful to let go, and very scary to change the role. My whole life had changed. As we emerge from our cocoon, we take time to adjust to our new circumstances. Things are different, and we have to learn how to handle our new selves. We act in new ways. The things we say are surprising to others, because it”s not what they”re familiar with. People respond to us in a manner in which we”re not used to. Because of my new attitudes, I lost some friends who couldn”t adjust to the shift. And I made new friends who were walking the same path I was. Eventually, the butterfly climbs free and rests, spreading its wings. For the first time, energy flows through them and they expand, finally ready to carry the butterfly on the breeze. Just as we soon feel confident with our new self, and we fly free, a beautiful butterfly gracefully fluttering from flower to flower. A living jewel fluttering about in the sky. There is a theory that states… If you step on a butterfly in this timeline, you alter all potential future timelines. In the 21st Century human consciousness is experiencing a metamorphosis of the slow moving caterpillar into the butterfly. The butterfly flies free in the mandala (wheel) of time. The Butterfly Effects signals the emergence of consciousness in the alchemy of time. The butterfly is great admired among American Indians and is a bringer of joy and peace. Cultures all over earth revere its delicate and colorful beauty. Most butterflies live very short lives, only a week or two, except for the Angle Wing and Monarch live about six months. They experience stages of development from egg in the cocoon to caterpillar to adult butterfly. The short life span and beauty of the butterfly is symbolic of early spiritual growth. Lessons of life will be shown during sometimes difficult formative years and come to light as the butterfly spirit begins to fly. They hold the gift of transformation and soul evolution. The butterfly is reminiscent of freedom and creativity. Butterflies have a pair of large compound oval eyes made up of thousands of individual lenses. They can see a single image clearly and are able to perceive ultraviolet wavelengths of light. This suggests clairvoyant abilities for those that hold this totem. The antennae of the butterfly have small knobs on each end which is said to play a role in orientation. When one antenna is missing the butterfly will fly in circles unable to find its way. Those with this medicine need to stay consciously connected to spirit at all times in order to arrive at their desired destination. Butterflies are not very organized, often return to the same flower many times before they realize it, and cannot remember relatives. This trait shows us to be better prepared for life’s challenges and relationships. The butterfly represents the process of transformation and shape shifting. When butterfly shows up, make note of the most important issues confronting you at the moment. What state of change are you at in regard to them? Butterflies remind us not to take life so seriously. They feed on flowers that they help pollinate, thereby further spreading beauty. They represent the element of air, quickly changing and ever moving, so gracefully. Butterflies are messengers of the moment. They come in a variety of colors. To understand the message that the butterfly holds for you a study of its colors can be helpful. 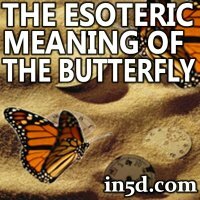 Whenever an eco-system is damaged, butterfly is usually the first to leave. They are especially sensitive to the harmony of earth. If butterfly comes to you in a hurt, trapped or ill way, you are being asked to stop disturbing the natural design of life and to flow with events in a more gentle, natural way. The butterfly is a very powerful symbol of transformation as our planet is currently undergoing a transformation of consciousness. As consciousness is evolving, the current definitions for dream analysis need to be amended. For example, a ladder in a dream may represent a raise or promotion if you are climbing the ladder. Now, the ladder may represent a DNA strand, which may imply an eminent DNA upgrade of an increase in metaphysical abilities. Similar with seeing a ladder in your dreams, a butterfly might suggest a spiritual progression or metamorphosis of consciousness. Iran’s supreme religilous and political leader Ayatollah Ali Khamenei has issued an unprecedented statement calling people across the world to prepare for the wars signalling the coming of Judgment Day. “We must prepare for the coming. Since we consider ourselves the warriors of the 12th Imam, we must fight,” said Khamenei in a position published simulaneously by a number of Iranian state media, reports Lenta.ru. “Under the leadership of God, and with his invisible Power, we will restore the glory of Islamic Civilization,” stated the Iranian supreme leader. Lenta.ru furhter writes that some months ago, a book entitled “The Last Six Months” was distributed among Iran’s army. According to the book, there is little time remaining for this world, as many prophecies of its end have come true, and accordingly soldiers and officers must be in a permanent war alert. According to Shia Islam, the 12th Imam, Muhammad al-Mahdi is a Messiah who at the end of days will come to the world to instore peace, prosperity and happines. This however will be preceded by a period of wars, famine, godlessness and rampant sin. In the past weeks, international tensions around developments in Iran’s ally Syria have intensified, as the bloodshed in Syria is violently escalating. At the same time, Iran itself faces new hurdles in its nuclear program and a raised militant rhetoric coming from Israel. It seems there’s another dog snack from China to worry about: sweet potato treats. If you’ve fed your dog either chicken jerky treats or sweet potato treats made in China and your pet has fallen ill, I recommend you contact your veterinarian – especially if the symptoms persist for more than 24 hours or are severe. Keep in mind that although the problem treats are often identified as “jerky” treats, they also go by a host of other names, including tenders, strips, chips, wraps, twists, and several others. For more information on why you need to be vigilant about reading pet food labels, making phone calls to manufacturers, and really doing your homework on what you’re feeding your dog or cat, read my article Pet Food and China – More Cause for Concern? PLEASE know that if you choose to buy any treat made in China, your pet may be at risk. Chicken jerky treats, chicken tenders, chicken strips, chicken treats or sweet potato treats, they can all pose a potential threat. Play it safe. Buy only food and treats made in the U.S. Buying pet food made in this country won’t remove all risk of winding up with a tainted product, but it will certainly improve your chances of keeping your pet safe. Plant estrogens, such as that found in soy, can have profound detrimental effects on a developing fetus. Exposure to estrogenic chemicals in the womb or during childhood has the potential to negatively affect a woman’s fertility as an adult, and has previously been linked to an increased chance of breast cancer. Update: Contrary to earlier reports, this explosion did produce a CME and the cloud is heading for Earth. According to a forecast track prepared by analysts at the Goddard Space Weather Lab, the CME will reach our planet on July 31st at 1500 UT (+/- 7 hours). Weak to moderate geomagnetic storms are possible when the cloud arrives. GEOMAGNETIC STORM WARNING: NOAA forecasters estimate a 45% chance of polar geomagnetic storms on July 29-30 in response to a high-speed solar wind stream buffeting Earth’s magnetic field. 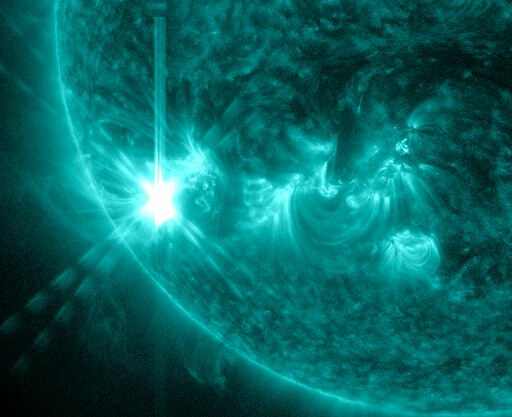 Even stronger storming could occur on July 31st when a CME associated with yesterday’s M6-flare arrives. High-latitude sky watchers should be alert for auroras for the next three nights. We do not expect damage from this earthquake and based on the visiting numbers in our site, the shaking will be mostly weak to very weak. Theoretical analysis from USGS reports a max. light shaking (MMI IV) for 3.6 million people. People in this part of the world are very much acquainted to earthquakes and are used to today’s kind of shaking. Update : EMSC reports for the same earthquake a Magnitude of M5.5 at a depth of 80 km. The juices may be flowing today, but it is a good idea to be aware of what they mean, where they are going, and how they are feeling. There are always those who are not wishing the best for you. They just might come forward, say things, do things, etc. to challenge your work, your opinions, your vision. It is time to be centered and strong in WHO you are. The illusions are always there, and in this energy they pile up in all areas. Take time to set an intention for the day and allow that to keep you going through all of the ups and downs. They are there. You might just be surprised at the people who are there for you and the ones who are not. Today starts on a kind of down note. It is hard to get moving, and then everything seems to be just too much. Even the simplest activity is enough to push you to the edge. Hang on, though, for things get better as the day goes on. Noontime will bring some interesting revelations, things you have been aware of but not really looked in the face. This will give you the strength to move forward and take some positive action in regard to an issue that has been bothering you for a while. Having done that, things will look better and better. You will find that some of the stuff you had dreaded, some things you thought were going to turn out badly actually have resolved themselves easily. There is an opportunity that is coming you way, and you will get wind of it this evening. It is time to get rid of some of the old stuff. What it is and how you go about it are your choices. But then again, you can choose to do nothing at all. Today is all about perspective, and this perspective is all about the choices you want to make in terms of what catches your eye and what is merely background noise. You have had time in the past few weeks to get some thing in order, to analyze, reminisce, and pick things out. Today is all about what you have accomplished in these activities. There is a mirror there. You can look into it or not. It will be there for a time, and then it is gone, and the illusion returns. No right. No wrong. When you are ready, then there it is for you. Take it or not. It is up to you. You will be called upon today to show your strength. It will be at a time when you are feeling vulnerable, perhaps because of something that was just said, something that happened, but you will need to pull yourself together and stand firm. Start the day with a grounding and centering exercise. Know that you are powerful and repeat, ‘In all I do, in all I encounter, I stand firm in my power and knowing.’ This will assist you in times of doubt. There are signs in the air today, and you will be very aware of them. There is always a helping hand. If you will reach a out and allow its grace, you can find yourself in comfort wherever you are. First Full Moon of August 2012: Tempers can rage today for no reason and in every direction, so set your intentions and ground, center, and go within before going out to deal with all the stuff that is out there. You have the strength, the resources, the humor to take on whatever comes you way today if you are accepting of all that you can do. So not only will there be testing on the outside, there will also be the trials of recognizing, facing and accepting the fact that you everything you need to deal with anything and everything that comes your way. This is a time for accepting and walking into your power. The choice is yours. You know what is right. Go for it. There is a bit of whimsy and fun in the air. The Trickster is about and ready to stick its finger into things. Keep a sense of humor about you, and remember that the Trickster is not always kind in the tricks that it plays. Be alert in all situations. Listen for the hidden agendas, and watch for the body language clues that will let you know truly what is going on. Things are uncertain, and people are feeling vulnerable and on the defensive. Do not play into their realities. Unless, of course, you choose to. This is a good time to be the observer. Things are falling into place, and patterns are emerging. You can have some of those ah-ha moments today if you step back and absorb what is going on. You may be looking for clarity today, but it is not there. Things are muddled and you can become befuddled. It is part of the crazy energy shift that is coming into motion today and lasting throughout the coming week. Criticism will not get you anywhere. It is a time for compassion. You can find that you are somewhat weepy as things are affecting you in odd and unexpected ways. There is the possibility of a large event coming before the day is over. Be ready for anything. Everything old is new again and vice versa, so you might just find yourself surprised by stuff that you that you thought was soooooo predictable.